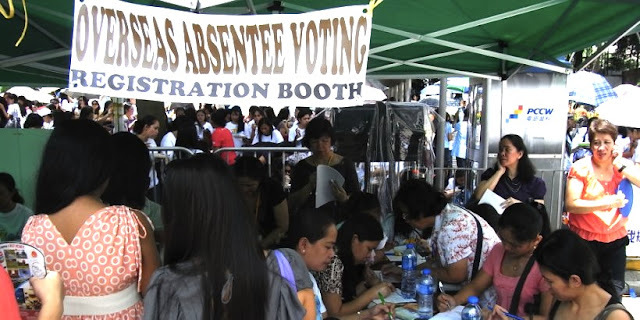 MANILA, Philippines- Beginning April 9 (8:00 AM in host country) until May 9, 2016 (9:00 PM Philippine time), Filipino overseas voters can cast their votes through Philippine service posts such as embassies, economic zones and consulates. Depending on the host city/country, Filipinos can vote in two ways according to the Commission on Elections (Comelec). Through personal voting, a voter must go to the designated Philippine foreign service post to vote. At the the designated post, a Special Board of Elections Inspector will check the identity of the registered voter by biometrics. After verification, the voter can get his or her ballot and a ballot secrecy folder and proceed to the voting area to accomplish the ballot. In Philippine foreign service posts with automated election system, voters may feed his or her ballot to the vote-counting machine (VCM). On the other hand, posts using a manual election system are required to fold their ballot in the same way as they received it and put it inside the ballot box. In host countries/cities using postal manual election system, registered voters will either receive mail containing their ballot or pick up their ballot at a designated area. The voter shall accomplish his or her ballot and put his or her thumbmark in the space allotted on the ballot’s lower portion. The ballot coupon must be detached from the ballot and placed inside the ballot envelope. This should be sealed with a paper seal. The accomplished ballots should be properly folded to avoid damage and mailed to the Philippine foreign service post concerned. Here’s a list of the Philippine foreign service post around the world in support for Election 2016. Philippine foreign posts that will use personal manual voting system.